In the 1930s Japanese military planners considered two potential threats to the Home Islands. The first one, for many years regarded as the most serious (although largely overestimated), was the Russian long-range bombers that could reach Tokyo from their bases in the Vladivostok area in just a few hours. At some point the Japanese estimated there were as many as 380 such aircraft deployed in the Soviet Far East. It was believed that the most effective way of neutralizing that threat was a preemptive land operation targeting the Soviet bomber bases. The offensive was to be launched in the early stages of a potential conflict in order to deny the Soviets long-range air strike capability. The task was assigned to the Kwantung Army (Kanto-gun) in Manchuria. The second threat was the U.S. Pacific Fleet, although the Japanese believed it had only a very limited capability to launch an invasion of the Home Islands. Nonetheless, plans were put in place to repel the potential attack by the US Navy using the forces of the Imperial Japanese Navy (Dai-Nippon Teikoku Kaigun), as well as the Imperial Japanese Army (Dai-Nippon Teikoku Rikugun). In the event of a U.S. attack Navy and Army bombers and torpedo aircraft were to strike the invasion fleet (especially aircraft carriers and transports) at a stand-off distance from Japan’s home waters. The airborne strikes were to be followed by naval operations against the enemy invasion force in which the US Navy warships would be either destroyed or forced to retreat. Finally, the Imperial Japanese Army units were tasked with neutralizing any attempted amphibious landings launched by enemy vessels that had managed to penetrate the first two defensive layers. At the same time Japanese long-range bombers would attack air bases in China to deny the Americans their use to support the invasion force. The early months of fighting in the Far East seemed to prove that attack was indeed the best way of defense. Lightning-fast march of the Japanese forces through South East Asia and the Pacific pushed back the enemy forces far away from the Home Islands and with it the threat of a surprise attack against Japan. The Japanese still considered the possibility of the US Navy carriers launching strikes against targets on the Japanese soil, but they believed those would be sporadic and rather limited in scope. In any event, the land-based fighter aircraft and anti-aircraft artillery units were deemed an effective and adequate protection against such attacks. In making air defense preparations, the first consideration must be given to invasion operations to be launched by the Army and Navy, especially their air forces. In other words, preparations for Homeland air defense must not interfere with the operations of our armed forces overseas. The strength currently available for Homeland defense is composed of approximately 300 aircraft, of which some 100 belong to the Army and the other 200 to the Navy, and approximately 700 antiaircraft weapons, 500 Army and 200 Navy, committed to the immediate defense of strategic points. Though small in number, these aircraft and antiaircraft weapons have been recently readied for action and training in their use is now being conducted. I do not think the enemy could raid Japan proper from the air immediately after the outbreak of hostilities. Some time would elapse before the enemy could attempt such raids. I believe that enemy air attacks against Japan proper in the early stages of the war would be infrequent and would be carried out by carrier-based planes. If it should become possible for the enemy to raid Japan from bases in the Soviet Union we might face considerable danger, but I think that this is not likely in the early stages of the war. Considering those words, the daring attack by the USAAF B-25B Mitchell bombers on April 18, 1942 must have come as a real shock to the Japanese high command. On that day 16 aircraft led by Lt Col James H. Doolittle launched from the USS Hornet and attacked targets in Tokyo, Yokohama, Nagoya and Kobe. The Japanese did not expect a raid by twin engine bombers and at such a long range from the Japanese islands. When the American force was first detected the time of the attack was estimated to be the morning of April 19 at the earliest, since the Japanese assumed it would be carried out by carrier-based aircraft with limited range. Therefore, when the B-25s appeared overhead they came as a complete surprise to the Japanese defenders. The air raid alarm was raised much too late and when the Army Ki-27 fighters were finally scrambled they either did not manage to intercept the intruders at all, or proved to be inadequately armed to inflict any serious damage. The U.S. bombers that were engaged and fired upon by the Japanese fighters emerged from the encounters virtually unscathed. The anti-aircraft artillery was equally ineffective: the low flying aircraft left the Japanese gunners precious little time to aim and fire their weapons. From the military point of view the operation had very little impact, which quickly prompted the Japanese press to ridicule the strike as the “do-little raid”. However, for the Japanese high command the affair was no laughing matter. The fact that the enemy aircraft appeared in broad daylight over the Homeland, dropped their bombs on Tokyo and then safely flew on to China was a sober warning that had to be reckoned with. Following the spectacular failure of the country’s air defense, the issue would have to be addressed to avoid such embarrassments in the future. For the Americans the Doolittle Raid was a major morale booster and a propaganda coup. It showed that an air strike against the Japanese islands was possible, despite the rather dire state of affairs in the Pacific. It also demonstrated that the only way to hurt the enemy on his own soil was through air attacks. However, launching more similar raids seemed impractical at that time: the potential losses would have very easily outweighed the necessarily meager gains of such operations. Americans needed a longer reach to bring war to the Japanese and they got it, just over a year later. It was called the Boeing B-29 Superfortress. The work to create viable air defense structures began in Japan before the outbreak of hostilities in the Pacific. The task was delegated to the Imperial Japanese Army. July 12, 1941 saw the establishment of the Boei Soshireibu (General Defense Command) based in Tokyo, which was responsible for overall defense of the entire homeland area. Operationally, the Command was subordinate to the Rikugun Sanbo Honbu (Imperial Army General Staff), which was in turn directly subordinated to the Daihonei Rikugunbu (Imperial General HQ, Army Section). The new command’s tasking included coordination of defense of the Home Islands, as well as Formosa (Taiwan), Korea (Japanese: Chosen) and the islands of Ogasawara Shoto (Bonin), Nansei Shoto (Ryukyu), Kazan Retto (Volcano), Chishima Retto (Kurils) and Karafuto (southern Sachalin). The first commanding officer of the General Defense Command (Commander-in-Chief of Defense) was Taisho Otozo Yamada, who was replaced by Prince Taisho Naruhiko Higashikuni a day after the war in the Pacific had broken out (December 9, 1941). Higashikuni remained in command until the Boei Soshireibu was dissolved in April 1945. The four main Japanese islands – Hokkaido, Honshu, Shikoku and Kyushu – were divided into four military districts (kanku) controlled by the Rikugunsho (Ministry of the Army). Hokubu-gun Kanku (Northern Military District) with its HQ in Sapporo was tasked with the defense of Hokkaido and the islands of Chishima and Karafuto. Tobu-gun Kanku (Eastern Military District) based in Tokyo covered the eastern part of Honshu (laying generally north of a line extending west from Suruga Bay to Wakasa Bay, passing north of Nagoya), including the Kanto region with the Empire’s capital. Chubu-gun Kanku (Central Military District) was headquartered in Osaka and tasked with the defense of central Honshu (laying west of the Eastern District and extending as far as a line drawn between Awaji Island and Shikoku, passing through Fukuyama north to Yonago), including the large industrial cities of Nagoya, Osaka and Kobe, as well as Kyoto – the nation’s historic capital. Seibu-gun Kanku (Western Military District) had its HQ in Fukuoka and was responsible for the defense of the western part of Honshu, as well as Shikoku and Kyushu. Each district (plus Korea and Formosa) had its dedicated army command of the same name: Hokubu-gun Shireibu (Northern Army Command), Tobu-gun Shireibu (Eastern Army Command), Chubu-gun Shireibu (Central Army Command) and Seibu-gun Shireibu (Western Army Command). 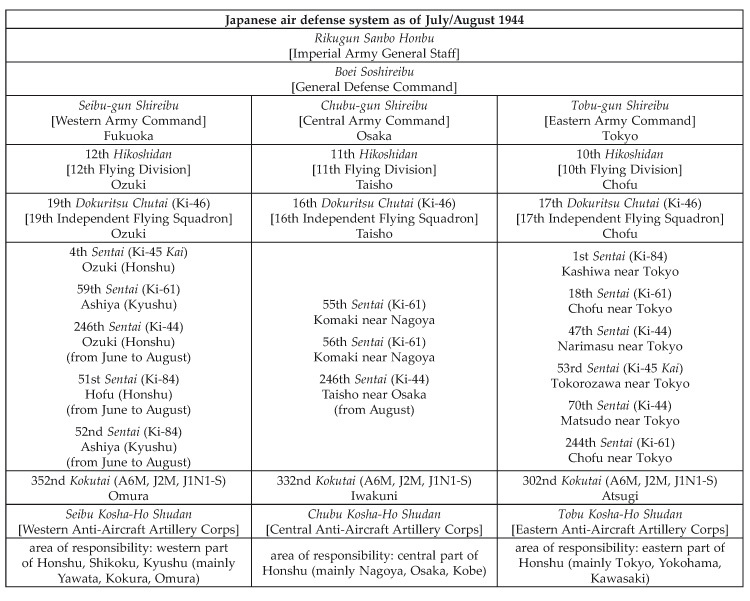 The army commands had operational control over their local land units, anti-aircraft forces and air defense fighter units of the Imperial Japanese Army Air Force (IJAAF). The commanding officer of the army command was at the same time the commandant of a military district. In this capacity he was responsible for implementing the orders from the Rikugunsho concerning the development of defense infrastructure and liaising with local civilian authorities. On the other hand, as a commanding officer of an army command the same individual reported directly to the Boei Soshireibu and was responsible for the defense of his district and the training of subordinate combat units. This dual tasking made coordination of defensive efforts and proper allocation of resources difficult. For example, all logistical issues were the domain of the Rikugunsho, while dislocation of military forces and the construction of fortifications were controlled by the Sanbo Honbu. In this context the Boei Soshireibu was in fact more of a coordinating body rather than a proper operational command. The Japanese air defense consisted of flying combat groups (hiko sentai1) and anti-aircraft artillery units (equipped mostly with Type 88 75 mm guns2) grouped into air defense brigades (boku ryodan). The air defense system was supplemented by military and civilian observation posts and very rudimentary Type Ko (A) radar stations3. In addition, the Navy provided a measure of early warning by deploying various types of auxiliary ships equipped with long-range radio sets some 950–1000 km (600 miles) east and south-east of Japan’s shores (so called picket boats). Among air defense areas of vital importance identified by Daihonei were Tokyo, Yokohama and Kawasaki in the Eastern Military District; Nagoya, Osaka and Kobe in the Central Military District; and industrial centers of Yawata and Kokura in northern Kyushu (Western Military District). The air defense units were dislocated in line with to those priorities. Similarly to the land forces, the air command and control structure was rather complicated. 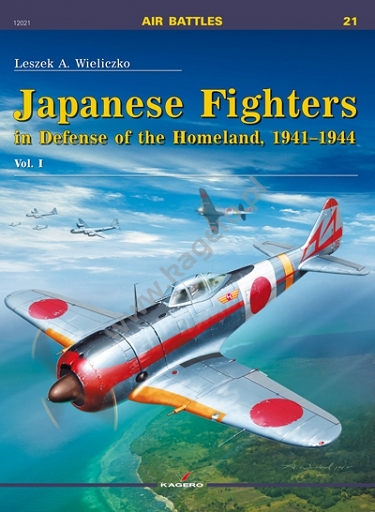 Japan’s air force was not an independent service. While the Army and Navy both had their own aviation services, the forces lacked dedicated organic command. Air defense sentais were under operational control of army commands in respective military districts which ultimately extended to the Boei Soshireibu. However, administratively the units were subordinate to both the Rikugun Koku Sokanbu (Inspectorate General of Army Aviation), which controlled crew and combat training and to the Rikugun Koku Honbu (Army Air Head Office), which was responsible for all technical aspects of Army Air Force (including aircraft production, flight testing of new aircraft types, aircraft allocation to combat units and distribution of spare parts). When the war in the Pacific broke out on December 8, 1941 (Tokyo time) the commander-in-chief of the Eastern Army Command Chujo Shizuichi Tanaka (replaced on December 24 by Taisho Kotaro Nakamura) had at his disposal two fighter groups (5th and 144th Sentai) and the Tobu Boku Ryodan (Eastern Air Defense Brigade). The Central Army Command (commanded by Chujo Yoji Fuji) included the 13th Sentai and Chubu Boku Ryodan (Central Air Defense Brigade). The 4th Sentai and Seibu Boku Ryodan (Western Air Defense Brigade) were subordinate to the Western Army Command under the command of Chujo Keisuke Fujie. 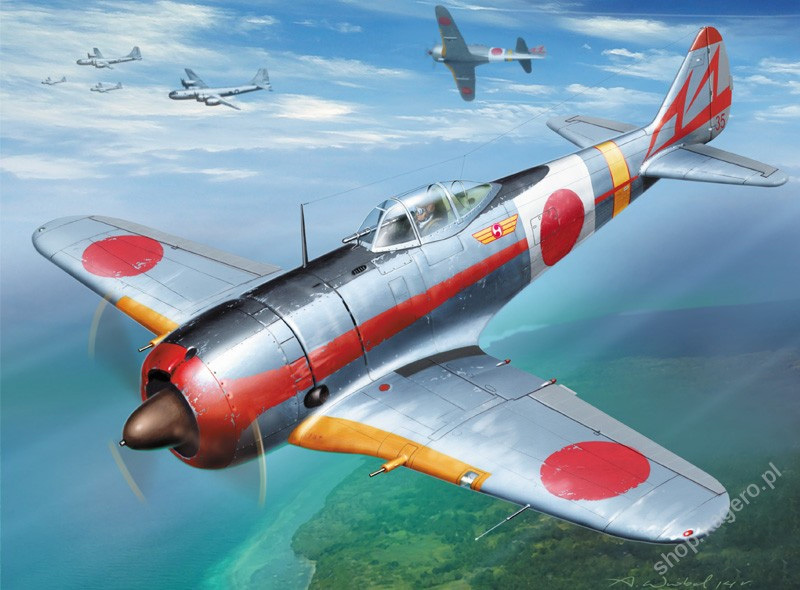 The air defense was augmented by 15 Mitsubishi Ki-15 reconnaissance aircraft from the 101st Dokuritsu Hiko Chutai (independent flying squadron) deployed to airfields in all three districts (Ki-15s were also fielded by the 4th and 13th Sentai). All air units were under administrative control of the 1st Hikoshudan (1st Flying Corps). The Northern Military District and Korea did not see deployment of any air units as the Japanese tried hard not to provoke the Soviet Union. Besides, they considered those areas to be rather unlikely to come under attack, mainly due to the lack of high-value targets. Strategic installations in the area (army bases, airfields and ports) were defended by dedicated anti-aircraft artillery regiments (rentai) or battalions (daitai). 5th Sentai (CO Chusa Kenzo Onda) was based at Kashiwa in Chiba Prefecture, not far from Tokyo. In December 1941 part of the group was detached to Matsudo to bring the aircraft even closer to the nation’s capital. At the start of the hostilities the 5th Sentai had 25 Ki-27 aircraft in two hiko chutais (flying squadrons). 144th Sentai commanded by Shosa Shigechika Tomari was established in July 1941 at Chofu near Tokyo as a dedicated air defense unit. The group consisted of two flying squadrons and had 19 Ki-27 fighters on strength. 13th Sentai under the command of Chusa Takeo Tateyama had three flying squadrons (after incorporation in November of the 102nd Dokuritsu Chutai) and 37 Ki-27 aircraft. The group was based at Taisho near Osaka, but its two chutais were also detached to Itami in Hyogo Prefecture and to Kashiwa near Tokyo. 4th Sentai (CO Chusa Shuichi Okamoto) also consisted of three squadrons after it had merged with 103rd Dokuritsu Chutai4 in November. The 1st and 2nd Chutai equipped with 25 Ki-27 fighters based at Pingtung (Japanese: Heito) in Formosa and 12 Ki-27s belonging to the 3rd Chutai deployed to Gannosu in Fukuoka Prefecture (Kyushu). In January 1942 all squadrons of the 4th Sentai were moved to Ozuki in Yamaguchi Prefecture (western Honshu), while all chutais of the 13th Sentai found their new home at Taisho.